Korea court upholds president’s impeachment – Royal Times of Nigeria. South Korea’s Constitutional Court has upheld a decision by the country’s National Assembly to impeach President Park Geun-hye. The eight judges on the court voted in a unanimous decisionto remove Park, the country’s first female president, from office. 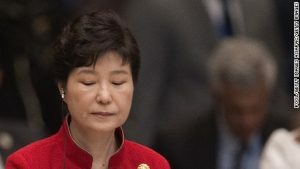 Park becomes the first South Korean president to be impeached. Prime Minister and acting President Hwang Kyo-ahn is expected to choose a date within 60 days for election to be held to choose Park’s replacement. The decision was announced by Justice Lee Jung-mi in a live, national broadcast. Park was impeached over her role in a corruption scandal involving close friend Choi Soon-sil. She now loses her presidential immunity and could face criminal charges. The judges in delivering their judgment said Park broke the law by allowing Ms Choi to meddle in state affairs and breached guidelines on official secrets by leaking numerous documents. Constitutional court chief justice Lee Jung-mi said; Her action seriously impaired the spirit of…democracy and the rule of law,”.